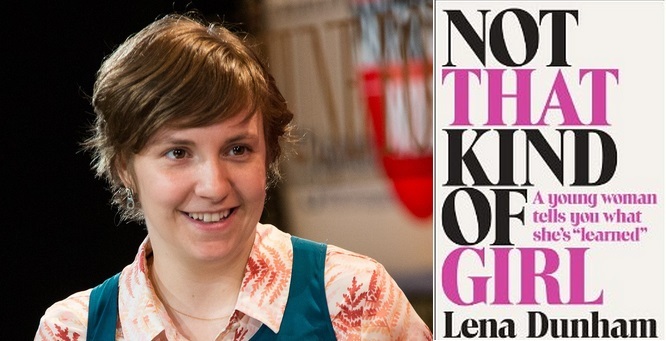 ‘Not That Kind of Girl’ is the title of actor and writer Lena Dunham’s new memoir, which has announced her as a fresh and vibrant literary voice. If you’ve ever seen her in the HBO series ‘Girls’, which she writes, directs and stars in as lead character Hannah Horvath, you may have wondered whether or not she is actually not acting but just being Lena Dunham. Both women reside in Brooklyn, talk incredibly fast with wit, smarts and brutal honesty and wish to establish themselves as writers and ‘voices of their generations’. Even if Lena Dunham’s real life is the basis for Hannah Horvath and all of the other characters from Girls, she is a talented writer who is funny enough, smart enough and genuine enough to justify a memoir at 28 years of age. Lena’s book is an easy and a fun read. It’s a collection of personal essays (and many hand-drawn illustrations), with each essay based on an episode from her life which she defines as ‘part of making one’s way into the world’. Her life experiences are varied and cover a lot of ground: falling in love; feeling alone; being ten pounds overweight despite only eating health food; thoughts on death and dying; the joy of wasting time and having to prove yourself in a room full of men twice your age. Lena constantly refers to her mum and dad throughout her book, using their experience and back stories to shade and colour her anecdotes. Both her parents are established artists and there is no doubt their support and creative nurturing have helped Lena’s talents to flourish. Lena has devoted two chapters to her parents in her book: ’15 Things I’ve Learned from My Mother’ and ’17 Things I Learned from My Father’.